Whether you are inspecting northern grown onions, or Bermuda Granex-Grano (BGG) onions grown in the South, you should always be careful to determine if decay is affecting the necks of the onions. The decay affecting the necks is usually found in onions that have been in storage, but weather conditions, rainy, wet weather, can increase the odds of finding it. As seen above, many times the onions will exhibit no external signs of having decay affecting the necks. An experienced inspector will be able to squeeze slightly on the neck and determine if the onion “might” be affected by decay. But in all cases, you must cut the neck to determine if the onion does have decay. The decay that is responsible, is called Gray Mold Rot (Botrytis fungus). Click here for more information regarding Gray Mold Rot. Since the U.S. Grade Standards only allow a tolerance of 2% for decay, careful inspection and cutting is essential while inspecting onions. When inspecting onions you will want to randomly cut at least 5 onions. Begin by cutting the neck, looking for decay, and then follow up by always cut the onion in half (making a crosswise cut) to look for internal defects or decay. I have seen many new inspectors pull out their knives and cut the heck out of onions, almost desperately searching for decay affecting the necks. Most of the time they do not cut the onion properly. There is right and wrong way to cut the onion. 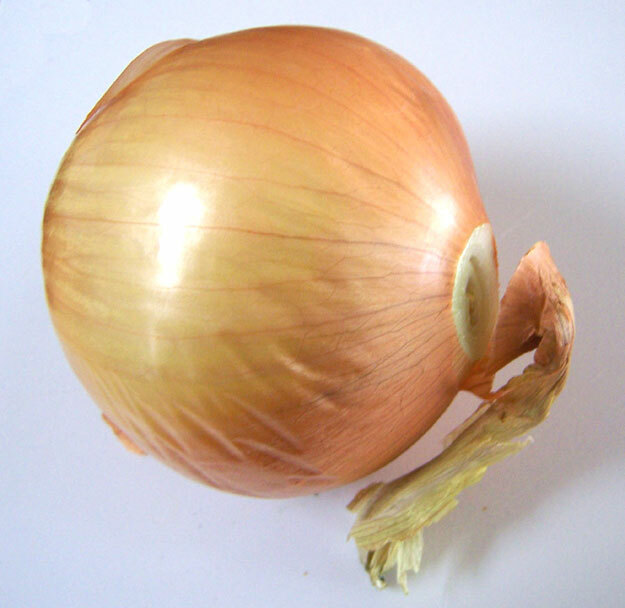 As shown above, using a sharp knife, make a cut as close to the bulb as possible, and make subsequent cuts deeper into the onion if you see some possible decay. Remember, always cut the necks of some onions, but if you do not find any problems, put your knife away.